Physician burnout is everywhere. It affects physicians, their colleagues and staff, their families and, ultimately, their patients. What can we do about it? Participants in this course will develop new knowledge and strategies that can be applied immediately to their unique hospital or clinic setting. The series begins with a framework for understanding physician wellness at the personal and institutional levels as well as within the culture of medicine. Additional topics include medical marriages/relationships, the ethical principles and obligations of burnout, when the doctor becomes a patient, and dealing with difficult patients/colleagues. Participants will develop skills for using self-compassion when coping with trauma and loss in medicine. Apply conceptual framework of physician wellness at the personal and institutional level and within the culture of medicine to their unique hospital/clinic setting. Give examples of how to assist a burned-out colleague. Analyze an important variable that affects physician wellness and assess strategies for support of relationships. Utilize a compassion-based strategy for self care when coping with struggles experienced in medicine. Apply principles of ethical obligations to their unique hospital/clinic setting. Summarize common insights physicians report when experiencing role reversal. Burnout: Is it Medicine or is it Me? Identity sources of personal-professional conflict that increase symptoms of burnout. 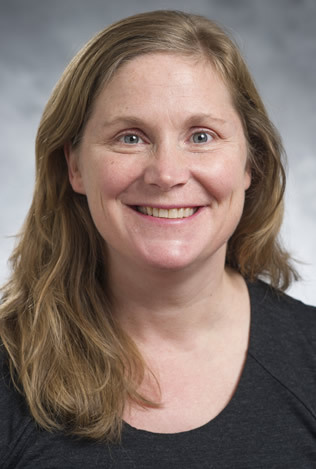 Kathy Stepien is a board-certified pediatrician and practicing pediatric hospitalist. She is the founder and CEO of The Institute for Physician Wellness, a mission-driven organization focused on improving physician wellness through retreats, workshops and consultations. 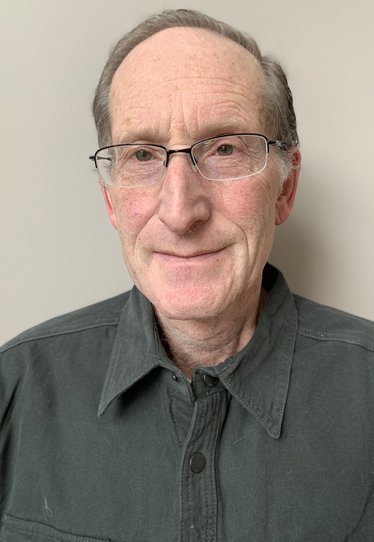 A prolific speaker and advocate of physician wellness, Dr. Stepien teaches both nationally and internationally. She holds a Master's degree in Philosophy and practiced physical therapy for 13 years prior to entering medicine. She draws upon these broad experiences as she works to support physician wellness at the personal and organizational levels as well as within the culture of medicine. Alaska Inside Passage - Winding along the breathtaking coast of Alaska, the Inside Passage offers magnificent views of forested islands, rock-walled fjords and snowcapped mountains. Richly diverse flora and fauna are also on display. 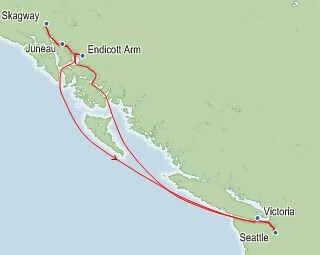 Skagway, Alaska - A frontier town perfectly preserved as the Klondike Gold Rush National Historic Park. Gateway to the Trail of '98, which you may explore by helicopter or vintage railcar. Endicott Arm & Dawes Glacier - One of Alaska's lesser-known gems, Endicott Arm Fjord marks the southern edge of Fords Terror Wilderness area. As you drift through its 30 -mile-long stretch, you can't help but be awed by the sorrounding granite cliffs, mountain valleys and dozens of gushing waterfalls. Drifting icebergs, deep blue waters and a spectacular tidewater glacier only add to this natural spectacle's appeal. Bedroom area with two twin beds that convert to Royal King. Full bathroom with tub. Sitting area with sofa that converts to double bed. Private balcony. 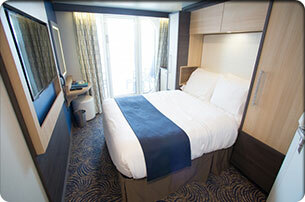 Stateroom: 267 sq. ft. Balcony: 81 sq. ft. Bedroom area with two twin beds that convert to Royal King. Full bathroom with tub, two sinks and second entrance that opens to living room. Living room with sofa that converts to double bed, entertainment center, and writing desk. Wrap around private balcony with seating area and private dining. Stateroom: 351 sq. ft. Balcony: 259 sq. ft.
One bedroom, two bathrooms. 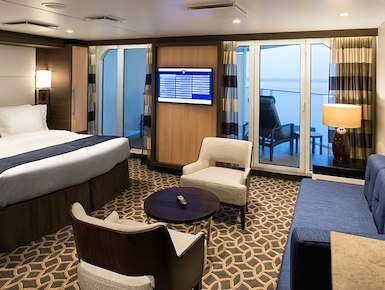 Two-decks-high stateroom with panoramic views. Main level has open living/dining room with double sofa bed, bathroom and private balcony with dining area. On second level, master bedroom has a King size bed with Duxiana Mattress and bathroom. 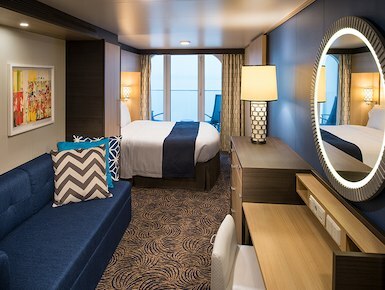 Stateroom: 696 sq. ft. Balcony: 216 sq. ft. Bedroom area with two twin beds that convert to Royal King. Full bathroom with tub, two sinks and second entrance that opens to living room. Living room with sofa that converts to double bed, entertainment center, and writing desk. Private balcony with seating area and private dining. Stateroom: 351 sq. ft. Balcony: 109 sq. ft.
Two bedrooms, two bathrooms, sleeps up to 8. Master bedroom with two twin beds that convert to Royal King, private bathroom with tub and separate dressing area. Second bedroom with two twin beds that convert to Royal King and two Pullman beds. Full second bathroom with shower. Living area with sofa that converts to a double bed, marble entry and entertainment center. Wrap around private balcony with seating area and private outdoor dining. Stateroom: 543 sq. ft. Balcony: 259 sq. ft. Bedroom area with two twin beds that convert to Royal King. Full bathroom with tub. Sitting area with sofa that converts to double bed. Private balcony. 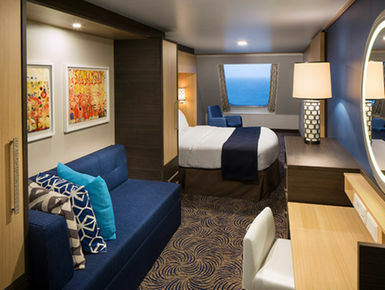 Stateroom: 276 sq. ft. Balcony: 161 sq. ft.
One bedroom, two bathrooms. 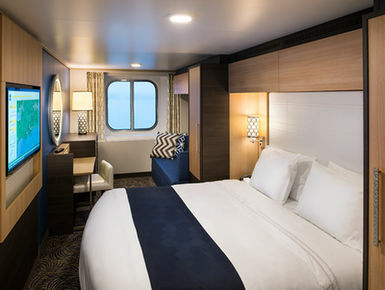 Two-decks-high stateroom with panoramic views. Main level has open living/dining room with double sofa bed, bathroom and private wrap around balcony with dining area. On second level, master bedroom has a King size bed with Duxiana Mattress, bathroom with shower and two sinks, and private balcony. 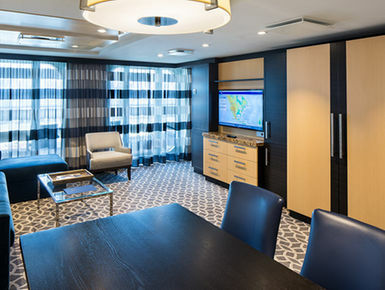 Stateroom: 975 sq. ft. Balcony 501 sq. ft. Bedroom area with two twin beds that convert to Royal King. Full bathroom with tub and two sinks. Separate half bath. Marble entry, large closets, living area with dining table and sofa that converts to double bed. Private balcony with seating area and private outdoor dining. Stateroom: 541 sq. ft. Balcony: 259 sq. ft.
One bedroom, two bathrooms. 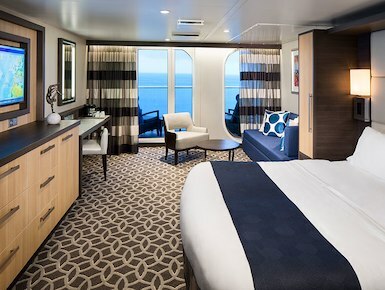 Two-decks-high stateroom with panoramic views. On main level, open living/dining room with dry bar and sofa that converts to double bed. Separate media room with sofa that converts to queen bed, second bedroom with closet and two twin beds that convert to Royal King and full bathroom with shower. Large private balcony with dining area. Master bedroom on second level has a King size bed with Duxiana Mattress and a private bathroom with soaking tub, shower, two sinks and bidet. Private balcony with dual whirlpool tub. Separate dressing area. 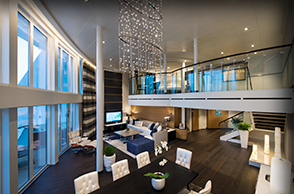 Stateroom: 1,640 sq. ft. 3 Balcony: 553 sq. ft.
One bedroom, two bathrooms. 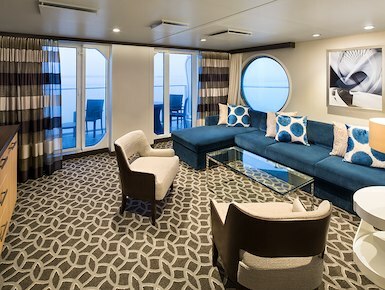 Two-decks-high stateroom with panoramic views. On main level, open living/dining room with sofa that converts to double bed. Full bathroom with shower. Private balcony with dining area. On second level, master bedroom has a King size bed with Duxiana Mattress and a bathroom with shower and two sinks. Stateroom: 673 sq. ft. Balcony: 183 sq. ft.
Two twin beds that convert to Royal King, sitting area with sofa, full bathroom and private balcony. 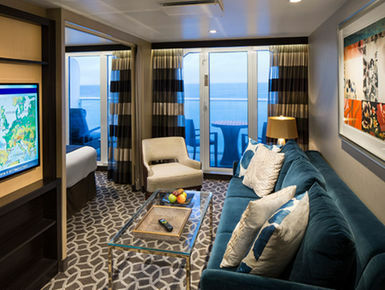 Stateroom: 177 sq ft., Balcony: 55 sq. ft.
Two twin beds that convert to Royal King, sitting area with sofa, full bathroom and private balcony. 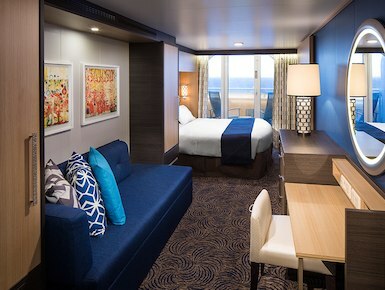 Stateroom: 198 sq ft., Balcony: 55 sq. ft.
Two twin beds that convert to Royal King, sitting area with sofa, full bathroom and private balcony. 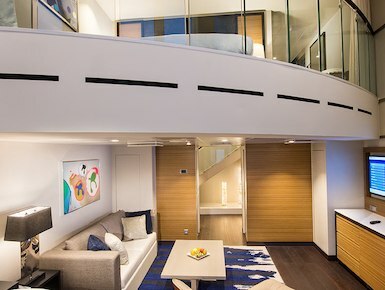 Stateroom: 177 sq ft., Balcony: 81 sq. 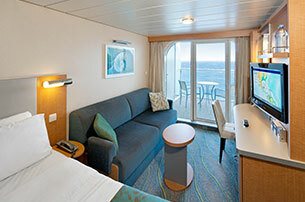 ft.
Stateroom: 177 sq ft., Balcony: 55 sq. ft.
Two twin beds that convert to Royal King, full bathroom and sitting area with sofa. Two twin beds that convert to Royal King, full bathroom and sitting area with sofa. 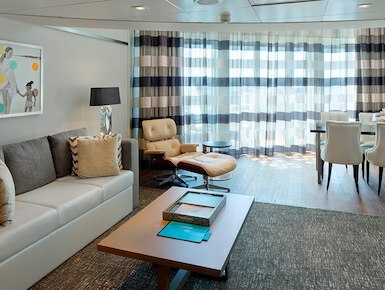 Stateroom: 214 sq. ft.
Two twin beds that convert to Royal King, full bathroom and sitting area with sofa. 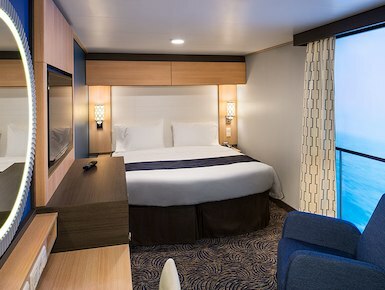 Stateroom: 182 sq. 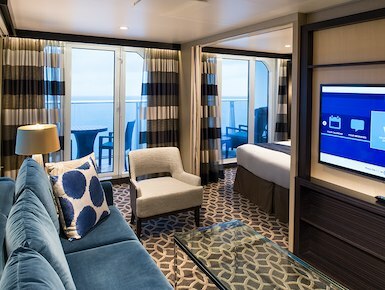 ft.
High-definition screen that spans nearly floor to ceiling, providing real-time views of the ocean and destinations. Bedroom area with two twin beds that convert to Royal King, sitting area with sofa, and full bathroom. 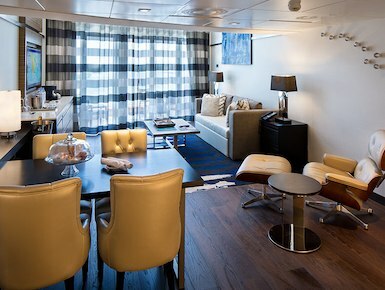 Stateroom: 166 sq. ft.
Full size bed and full bathroom. Enjoy Virtual Views of real-time scenery via your flat-screen television. 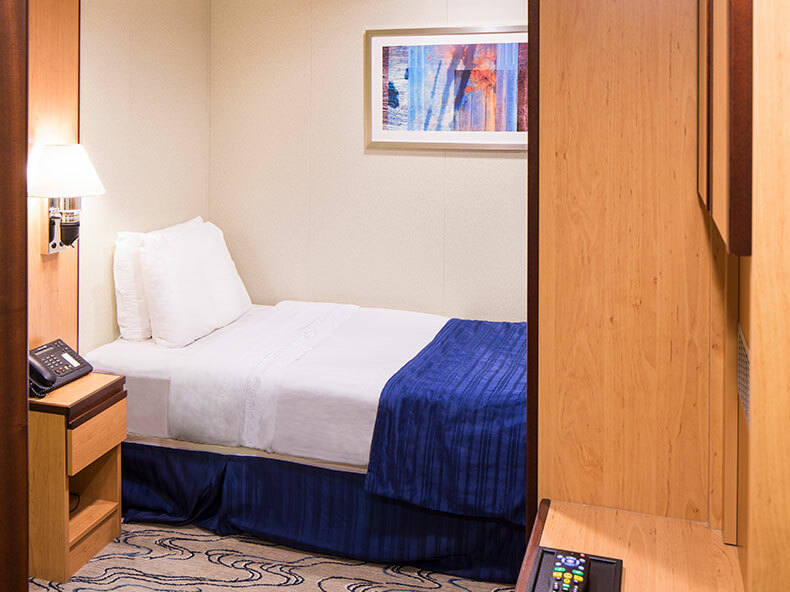 Single occupancy stateroom, no single supplement required. Can sleep up to 1. Stateroom: 101 sq. ft. Port Charges, Taxes & Fees $416.32 per person.